My gardener’s heart has been broken many times, and that is exactly why I love to garden. To clear a space in the dirt, and wash away the losses from failed fruits from years before, is a way to heal. This Jack in the Beanstalk fort is actually my 10th attempt. In the past, my failure has always been due to a lack of sunlight. My sons, even though I keep them actively involved in the planting, watering and the measuring, do not carry the same sense of elation I feel when we measure the vines and watch the fort flourish. They lack a gardener’s broken heart. They have not watched an abundance of tomatoes get green on the vine, only to have them decimated by chipmunks before the fruits have a chance to turn red. The vines on their fort have never turned yellow and shriveled due to a lack of rain; and bugs have not bored holes in their vines and destroyed the roots. Their joy at watching the walls of the fort start to create their hiding spot is always naively reserved. 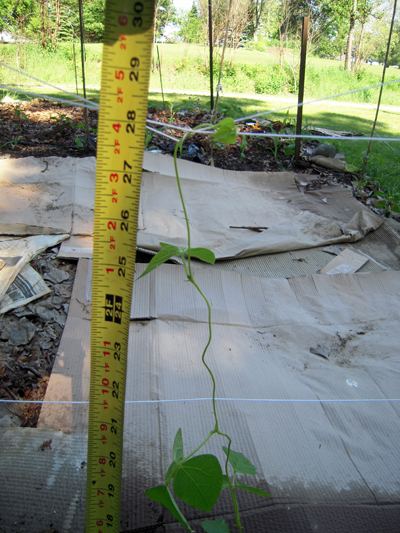 I measured the bean fort on May 31, but didn’t post the picture of the single vine’s 30 inch growth. 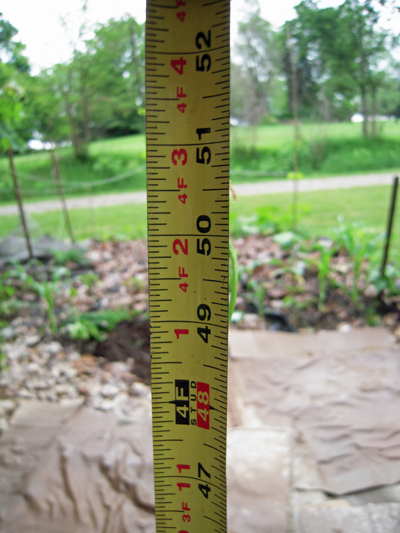 Now, two weeks later, the vine is hovering around 50 inches. The vines are actually taller, if you factor in the number of inches it takes to swirl around the poles. The vines have surpassed the danger zone, and will continue to grow to their twenty feet height. 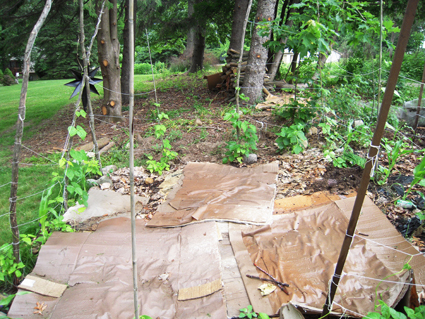 Already, the fort is already taking on the shape of a magical idyllic place to hide — perfect for reloading cap guns. To the boys, the fact that these vines flourish, even after the seeds are started on trays, transplanted to grocery bags, then transported hundred miles away on Memorial Day, and left for weeks on end to fend for themselves until summer break, is not viewed for the magic that it truly is. Besides, it grew just fine last year. The miracle of Jack in the Beanstalk’s magic seeds may be lost on the youth, but not on me. My best shot. For more, visit Tracey. can’t wait to see how this project turns out — even if your kids aren’t that excited about it :). So cool! I haven’t ever heard of that either — and I am with everyone else…I can’t wait to see how it turns out! How cool! I’m totally doing that once my kids are a little older. I planted some bush beans this year for the first time, and they did ok. I started them too early inside, though, and by the time I got them planted they were bolting! I got a few handfuls of very early produce off of them, at least! I love how you’ve turned it into something so magical. It’s that enthusiasm makes it all so memorable. My oldest started her own garden and loves to go out EVERY day and to see how much it’s grown. I love that about her. What fun! I wanted to do a sunflower fort this year but didn’t get around to it. Magical forts and toads – what an idyllic childhood.